Summer, with its brutally oppressive heat (and, at least here in New York) brutally oppressive humidity has finally come upon us. Today I was standing, nothing more, just simply standing, and I broke out into a sweat, and the high was somehow only 89 degrees. No, I'm not fat, I know what you were thinking. Okay, not that fat. Jeez, you people, so judgmental. Anyways, the point I'm getting at is that the annual turning of the seasons has brought us to the current one, and it is much too hot to be playing outside or making friends or whatever it is your mother told you to do all those years ago during the summer. 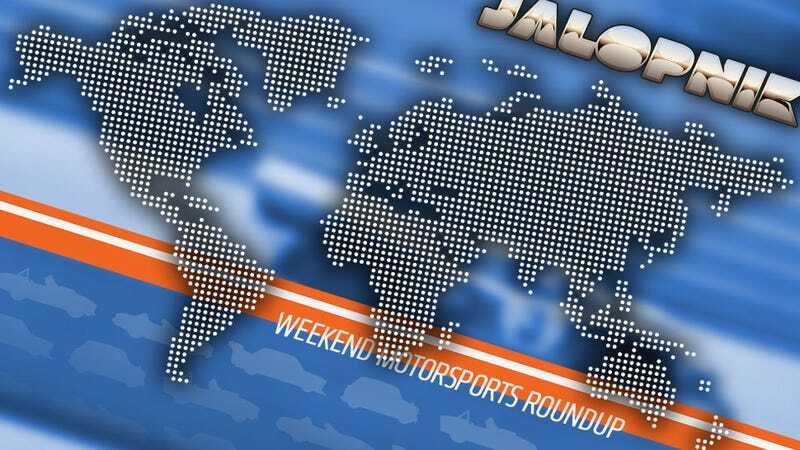 Now is the time to sit in the nice, cool air conditioning, telling all your friends on the Twitter about the Jalopnik, and catching up on all the racing that's been missing from your life. This weekend's big race is the Pikes Peak International Hill Climb, the most famous of all hill climb-style events. Drivers in specially-constructed machines sporting over 1000 horsepower race to get to the top of Pikes Peak, a mountain in Colorado. Without guard rails and at death-defying speeds, the race at Pikes Peak is one of the true spectacles of motor sport. Don't believe me? Check out this in-car video. Last weekend was Le Mans, and like any good feast that lasts way too long, now is the time to rest and recover. As such, the rest of the schedule is relatively light, save for the occasional Formula One race that may break out. Weirdly, this week's F1 race is actually first being broadcast on CNBC, which is convenient for those own a racing team. Just make sure to watch out for that for all you who enjoy watching the race live. If you can't get up early enough because it's Sunday and who would do that, NBCSN will be running a replay a bit later in the day. Also, make sure to watch out for any awkwardness between Mark Webber and his team at Red Bull Racing (more awkwardness than usual, I mean). For those who haven't been following, Mark Webber this week announced he was abandoning the horrible relationship he had with the team and will be joining Porsche's new sports car program at the end of the year. So it's a bit like when you break up with a significant other but your name's still on the lease so you can't move out and it's awkward and you still have to see each other constantly. Should be fun. If you're still jonesin' for some endurance racing at Le Mans, the Rolex Sports Car series will be making a six-hour appearance at Watkins Glen, which is always a good time. And for those who believe that two wheels are not in fact the work of the devil, there's both the MotoGP race in the Netherlands and some good old-fashioned motocross in Massachusetts. Of course, the NASCAR and NHRA travelling circuses both make appearances this weekend as well.